SUNRISE, FL – It’s a streak that would do any sports dynasty proud. 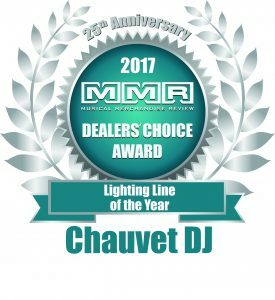 For the fifth consecutive year, CHAUVET DJ has been honored with the MMR Dealers’ Choice Award for Lighting Line of the Year. Presented by MMR magazine, the award is based on voting by music dealers across the USA. Riding on the popularity of products like its Freedom series of battery-powered wireless fixtures, Intimidator moving heads and Festoon outdoor rated décor lights, CHAUVET DJ was the clear winner in this year’s balloting. “CHAUVET DJ has had a virtual lock on this category – and it’s easy to see why,” wrote MMR in its report on the awards. The magazine singled out the company’s “innovative designs and value-oriented prices” as keys to its enduring popularity among music dealers.